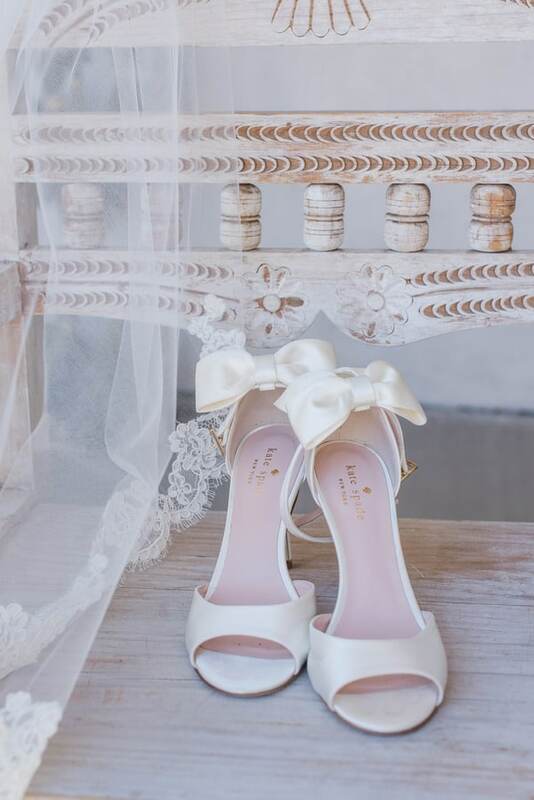 Cute heels from Kate Spade! 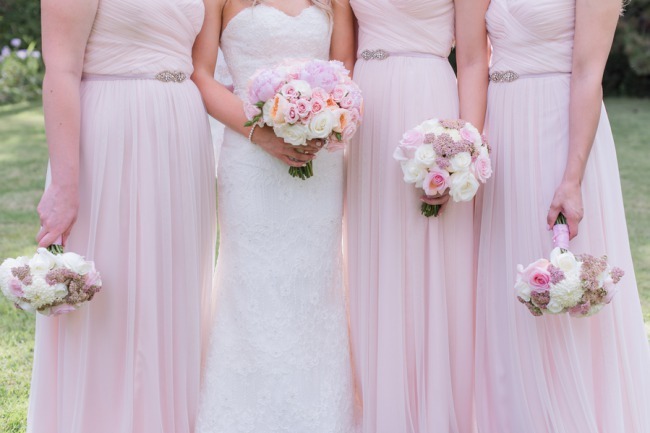 Gorgeous flowing bridesmaids dresses in pale pink from BHLDN. 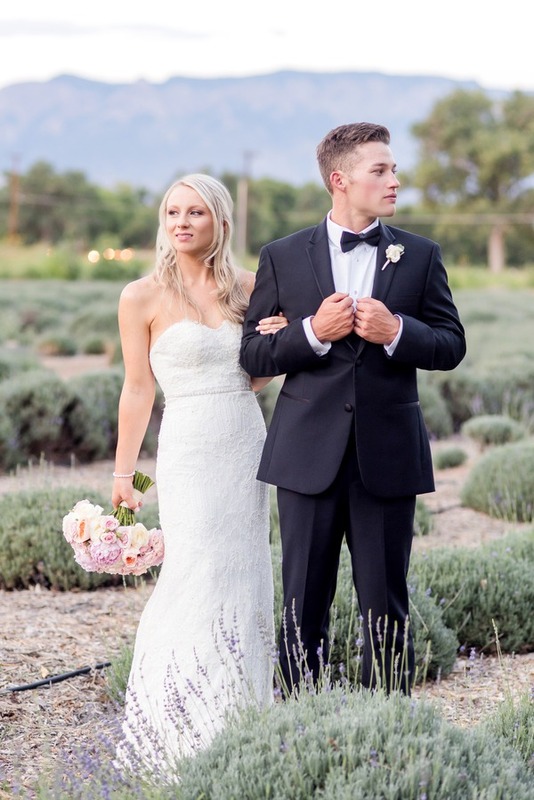 Photographer’s Remarks: “Lavender fields, peonies, chiffon BHLDN gowns … Emily + Justin’s wedding is what Pinterest dreams are made of! 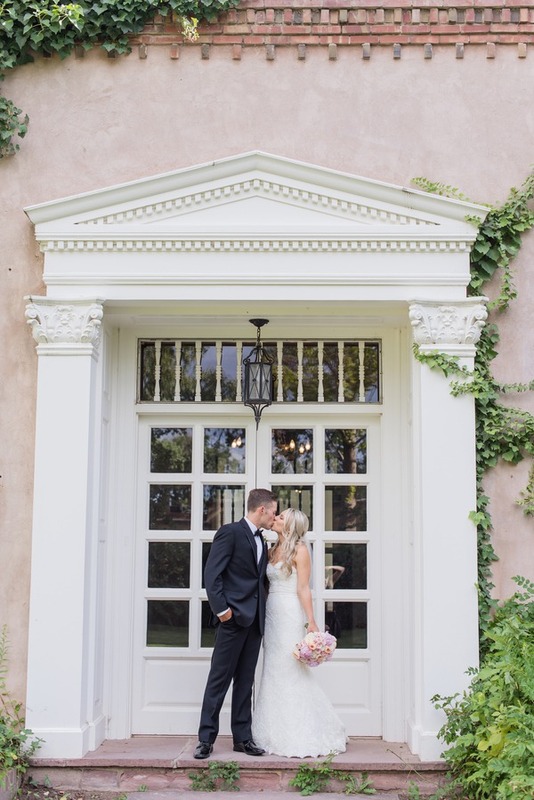 “Taking place at the beautiful historic Los Poblanos Farm, the couple was wed on their lush green lawn under a canopy of roses. 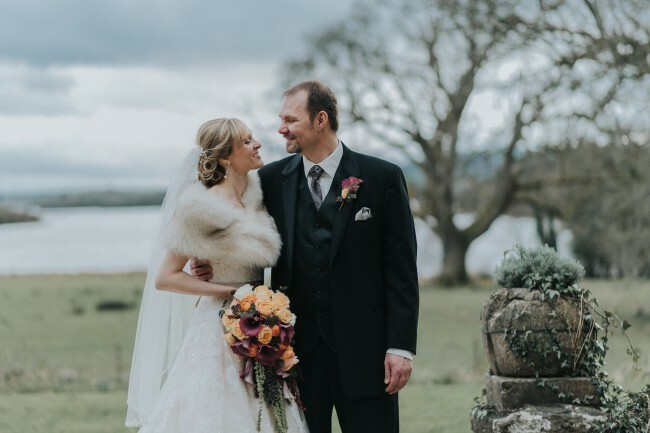 Emily looked stunning in her beautiful strapless Martina Liana gown with peonies in her hand that matched her bridesmaids flowing BHLDN pale pink dresses perfectly. “Guests enjoyed sangria and margaritas as they ate yummy custom cookies from Albucookie by the estates beautiful swimming pool. There wasn’t a dry eye in the house as Emily’s parents gave their toasts and spoke of how this sweet couple have been together since high school. I have been planning my wedding since I was a eight years old, after I was a chosen as a flower girl in a family friend’s wedding . I spent countless days watching “Who’s Wedding Is It Anyway?” and planning fake weddings with various color palettes, bridesmaid dresses, and of course, my dream gown. Not long after I met Justin, I knew that we were going to spending the rest of our lives together. Six years later he finally proposed and I got to start planning my dream wedding! I knew I wanted my theme to be very classic. I wanted to be able to look at my wedding photos on our fiftieth anniversary and fall more in love with every detail. I always pictured my bridesmaid in a pale pink that would be perfectly complimented by a beautiful bouquet of roses. 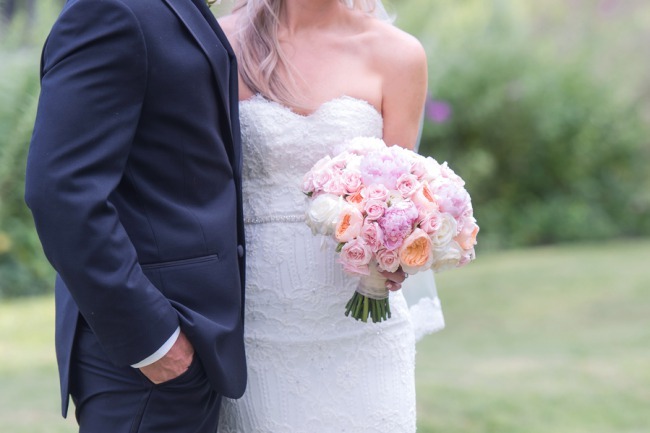 I would be wearing a strapless gown that fit flawlessly as I held a bouquet of peonies. My groom would be in a classic black tux, with a bow tie of course. 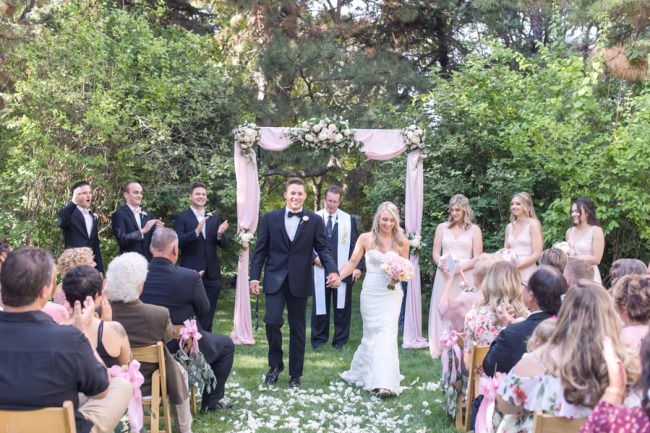 My guests would describe my big day as picturesque, elegant and timeless. 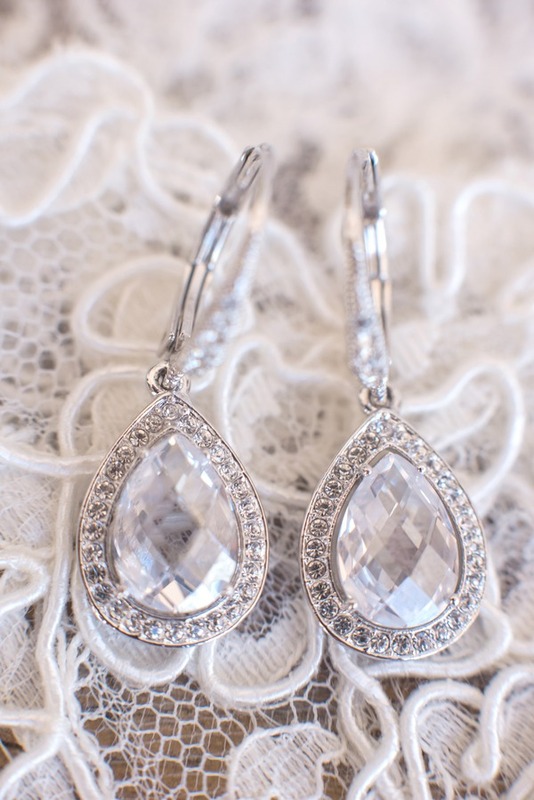 My inspiration for the wedding ceremony and reception were a continuation of my overall theme: timeless elegance. I wanted to complement the style of Los Poblanos with all of our decor. 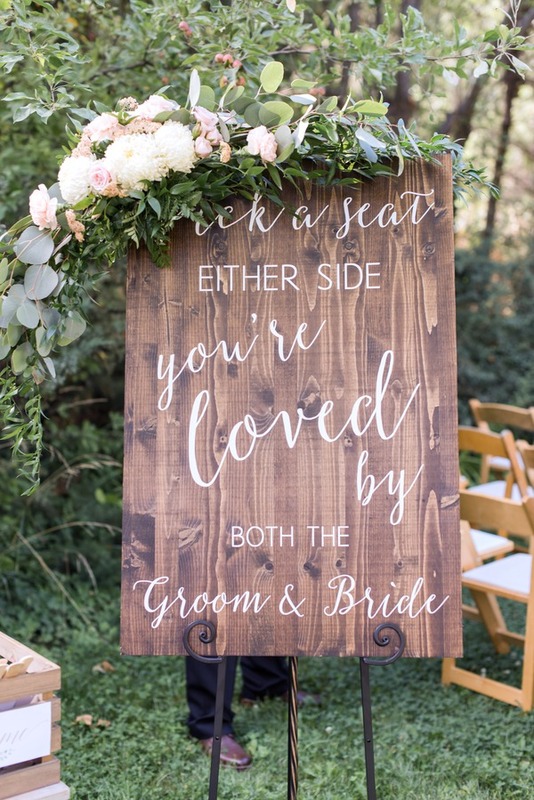 We selected dark walnut wooden signs for the ceremony and reception. 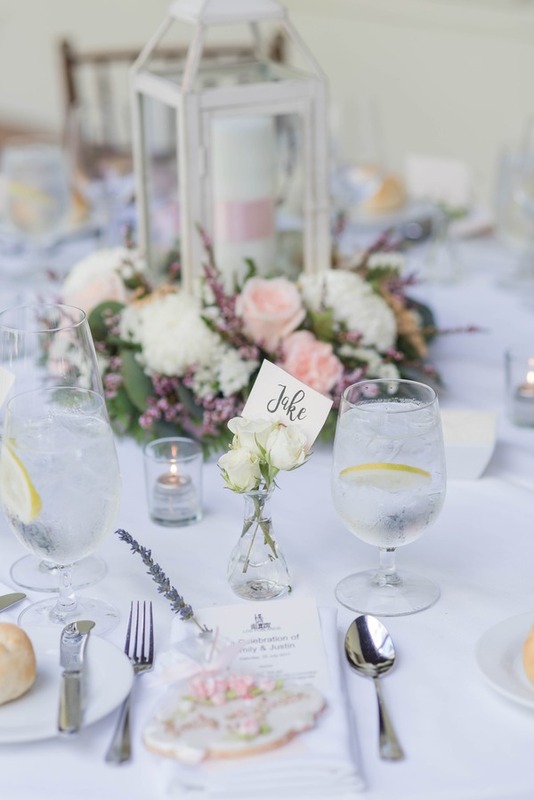 The welcome sign, ceremony sign and table numbers were the perfect contrast to the the light romantic color palette. 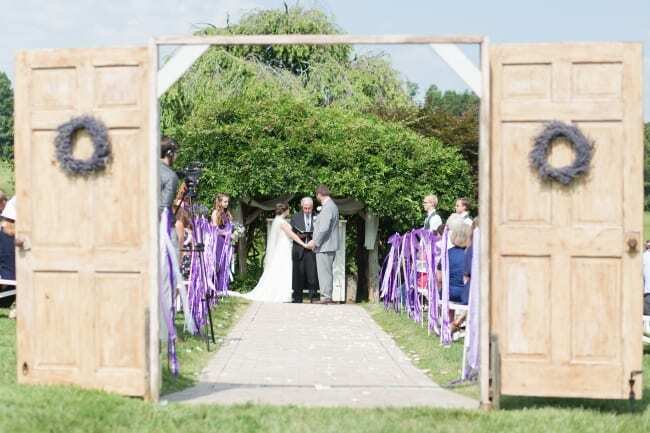 We had a beautiful arch filled with flowers and white rose petals down the aisle for our ceremony space. Flowers were such an important component to my vision. I wanted the ceremony and reception to be filled with fresh flowers. 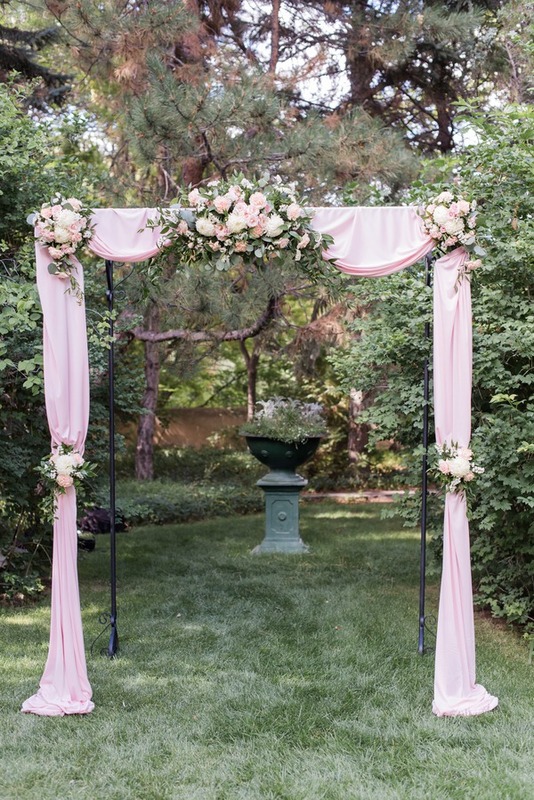 We had a gorgeous floral arch that was the perfect ceremony backdrop. I held a bouquet of pink peonies and white roses. My bridesmaids’ bouquets complimented their BHLDN dresses flawlessly. When I was selecting centerpieces for the wedding, I knew that I wanted something unique. 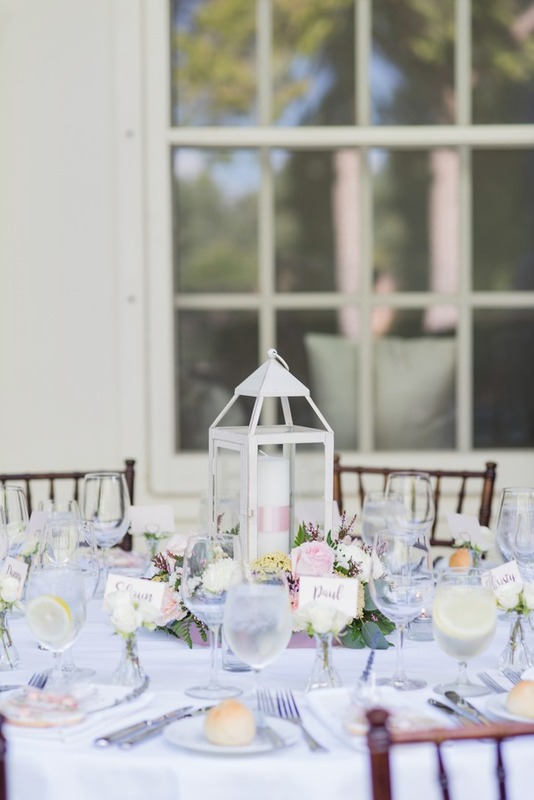 We ended up deciding on white lanterns surrounded by fresh florals with a white candle and blush ribbon. For the place cards, each guest received a bud vase filled with white spray roses. My wedding dress was one of my favorite details of our big day. I found my perfect gown at Mariee Bridal in Phoenix, Arizona. My mom and I were in Phoenix so that she could receive a specialized form of radiation treatment. After her treatments were over we decided that we needed to do something to cheer us up, so we went dress shopping. I actually had a very difficult time selecting my gown because there were so many gorgeous dresses to choose from. When I finally narrowed it down to two dresses, I let my mom pick her favorite. She decided on a strapless Martina Liana gown complete with vintage lace, crystals, and buttons down the back. It was classic, timeless and everything I had hoped it would be. The groom’s look was quiet simple. We both wanted a classic feel for the guys, so we decided on a black tux with a bow tie for Justin. The groomsmen wore a black tux with blush bow ties that matched the bridesmaid dresses perfectly. Justin and I met our sophomore year of high school. We had gone to the same school since sixth grade, but had never met. After experiencing high school bullying at its finest, I decided to transfer schools in the middle of my sophomore year; Justin transferred to the same school two weeks later. We quickly caught each other’s attention and started dating soon after. Once high school was over Justin joined the military and I started college at the University of New Mexico. Despite what most people expected, our relationship grew stronger. We were long distance for the next three years. We even went 364 days without seeing each other while Justin was stationed in South Korea. I spent many holidays and school breaks traveling to see him, even if it was just for a day. Last year Justin, my family, friends and I traveled to New York to celebrate my birthday. I was so excited to spend an entire week with all my favorite people. The day before my birthday Justin planned a day full of site seeing which ended with a trip to the Brooklyn bridge at sunset. We got halfway over the bridge when we stopped to take a photo. As I smiled at the camera, Justin turned and got down on one knee. He asked me to spend the rest of my life with him, and of course, I said yes! We both feel so lucky to have found each other. The aisle. It was a moment that I will never forget. As my dad and I walked down, I was able to see all of the wonderful people that had taken time out of their busy lives to watch us get married; to top it off Justin was waiting for me at the end of the aisle with the biggest smile I had ever seen. Make Lists! My mom made a binder that had different tabs for each part of the wedding. It made it so much easier to have all of our things in one place. We also had a “things to do” section and a “questions” section that we could refer to as needed. 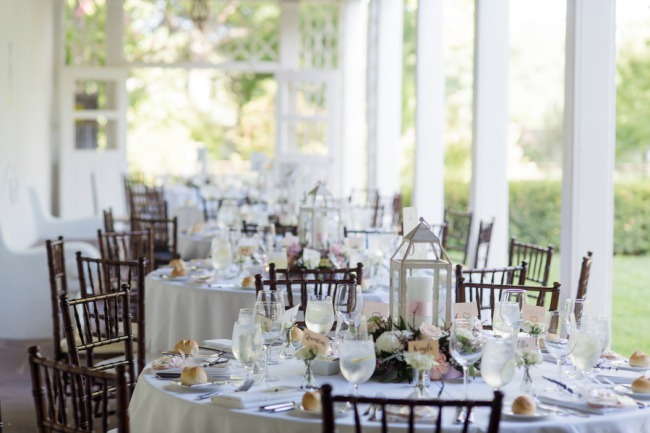 Meet with your wedding vendors in person (more than once!) Although your wedding is the biggest day in your life, it is important to remember that your vendors have many clients. 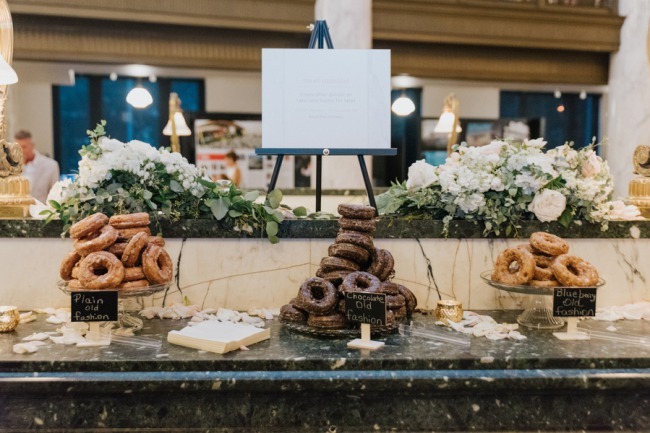 I discovered that it was really helpful to meet with my vendors in person a couple weeks before the wedding to make sure we were still on the same page and everything was on track. Although I believe that all of my wedding vendors are superheroes, I had to remind myself that they are only human and being as helpful as possible will make your wedding run smoother! Don’t leave things to the last minute: My mom and I made monthly checklists that helped keep us on track. Starting 6 months before the wedding we made lists of everything that had to be done each month. It helped to keep us on track and avoid leaving to many things for the month of the wedding. Remember this day will be over before you know it. Unfortunately I spent way to much time stressing over little details that were so small when I look back on it. Although its difficult, try your best to enjoy the entire process, it will be gone before you know it! If you are a planner then hire one! Even though it was stressful, I LOVED planning my wedding, but everyone isn’t like that. There are so many incredible wedding planners out there; hire one of them if you are worried the planning process will be too much!